Check out our past webinar recordings here. Join us for these complimentary webinars, as we dive deep with representatives from each of these winning organizations on how we might adopt similar strategies and programs to address MMH in our own communities. Register to attend 1 or all remaining webinars. There’s no charge, however, you must register to receive a link to each webinar and its recording (sent even if you can't attend live). 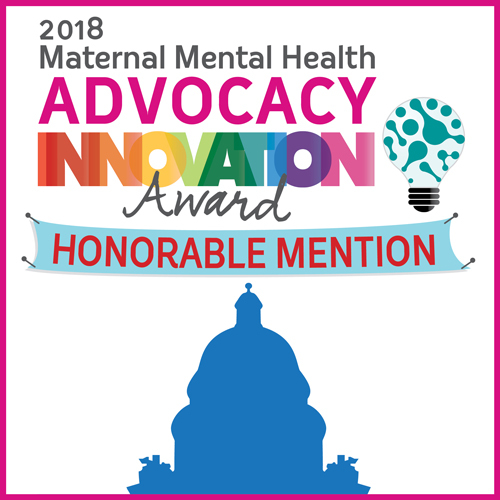 After conducting a community mental health needs assessment in Alachua County Florida, the Alachua County Perinatal Mental Health Coalition (ACPMHC) used report findings to drive several initiatives to address maternal mental health. The findings were sent to several state legislators which prompted a state senator to outreach ACPMHC’s Executive Director to draft Florida’s first piece of legislation addressing postpartum depression and related illnesses: The 2018 Florida Families First Act (SB 138/HR937). Tuesday, January 22, 2019 – Webinar link and Webinar Slides, Fact Sheet and Executive Summary. This team worked on creating and advocating for legislation that became the Illinois Public Act 100-0574. This groundbreaking legislation is the first criminal law in the United States recognizing the effects of postpartum depression/psychosis for a mitigated punishment for women convicted of infanticide whose crime was committed while mentally ill, under the influence of her postpartum illness. Tuesday, February 12, 2019 – Webinar link and The Ground-breaking Legislation and Award Submission. Postpartum Support Virginia (PSVa), a statewide non-profit organization, with initial funding from a local community foundation, the Rotary Club and the Junior League, and in partnership with the local hospital, hosted and facilitated this multi-provider and community coalition in Williamsburg VA. The coalition ran from January-December 2017. The Nan Tolbert Nurturing Center is a non-profit organization serving Ventura and Santa Barbara Counties in California. Their Emotional Care Program provides psychotherapy and non-clinical home visiting support for mothers. Thursday, February 28, 2019 – Webinar link. Docs for Tots is a New York based non-profit organization, which brings together children’s doctors and communities to promote best practices, policies and investments that foster children’s healthy development and future success. Docs for Tots developed the maternal depression screening and treatment program “Well Moms, Well Tots” in Nassau County NY within three federally qualified health centers. Tuesday, February 26, 2019 – Webinar link and presentation slides. The Park Nicollet Health System in Twin Cities, MN convened a process improvement team to create a universal maternal mental health screening program. Housed in the Behavioral Health Department, the program serves women struggling with fertility, birth loss and women during the pregnancy and postpartum periods. Thursday, March 7, 2019 – Webinar link. Need an intro to maternal mental health? Join 2020 Mom and PSI to learn about the range of maternal mental health disorders, risk factors and treatment options. This webinar is designed for providers, administrators and public health employees, although everyone is welcome. Complimentary.